With so many charity run/walks, you’d think the nonprofit community would be out of ideas, but this type of event continues to raise money and awareness for causes ranging from illness to human trafficking to veteran services. While it’s easy to lump all these run/walk events together, it helps to highlight individual successes and the lessons they offer nonprofit organizations that are planning their own fundraising event. Here are four charity run/walk events that are using modern fundraising technology and sound strategy to raise tens of thousands of dollars. Find out how they used this classic fundraising model to mobilize their community. The Epilepsy Foundation has been working to prevent, control, and cure epilepsy since 1968. For nearly 50 years they have educated the public, advocated for progress, and supported new research and treatment methods. 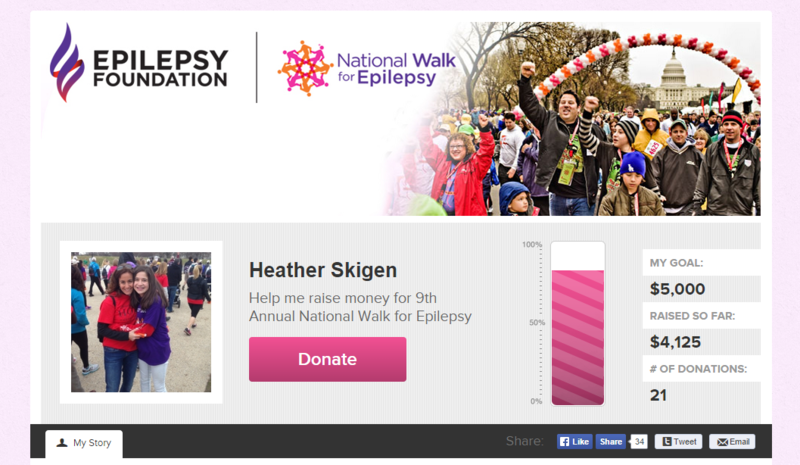 Their ninth annual National Walk for Epilepsy takes place April 11, 2015 in Washington DC. The Epilepsy Foundation has been hosting this event for nearly a decade and knows the value of peer-to-peer fundraising. In order to make sure all their supporters and participants knew how to get involved, they created a series of short videos showing how to register, create fundraising pages, and join a team. All of the videos are under three minutes and show how easy it is to get involved. Once supporters create their fundraising page, the Epilepsy Foundation has a whole page of resources to help them succeed, including images, sample emails, and an offline donation form. They even created a Walker’s Guide to help fundraisers reach their goals. By offering these resources, the Epilepsy Foundation provides the support that helps fundraisers succeed. Dozens of fundraisers have raised over $1,000 and some teams have raised over $10,000. Takeaway Tip: Provide awesome instructions and fundraising resources to help your supporters become successful fundraisers. Because the affected populations are smaller than more well-known illnesses, it can be extremely difficult to educate and advocate for rare diseases. Global Genes is uniting and empowering the communities of hundreds of rare diseases to band together and support research, treatment, and education. They face many different challenges, but they can show their mutual support by wearing Global Genes’ blue denim ribbon symbol. 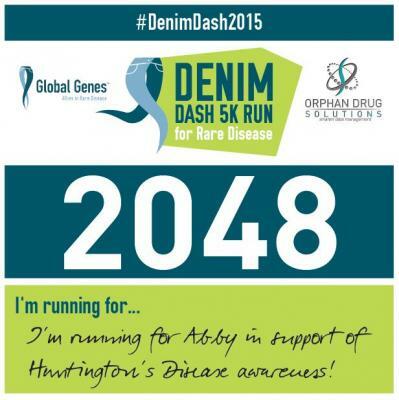 Much in the way they connect different communities, Global Genes decided to make their Denim Dash inclusive to all by creating a virtual 5K. People all over the world can register, fundraise, and participate, whether they’re running a mountain trail, claiming a treadmill at the gym, or simply racing to meet their fundraising goal. While virtual 5Ks do make fundraising events accessible in a variety of locations, they run the risk of losing the excitement and community experience of a road race. 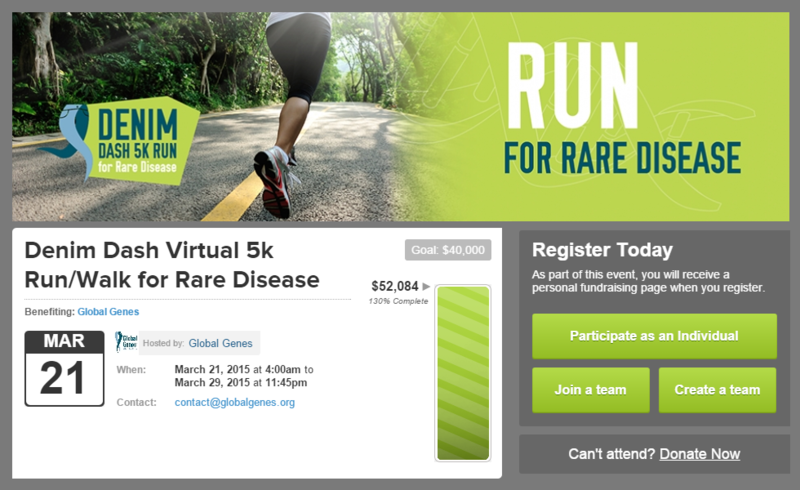 Global Genes faced this challenge by making their virtual 5K a true event. Registrants received a race pack with a T-shirt, a race bib, and a blue genes ribbon. Like their fundraising page, participants could add their personal reason for running on the bib. Even if someone was the sole participant in their city, they could share their route and passion by connecting with other supporters online using the hashtag #DenimDash2015. Global Genes worked hard to make sure they didn’t have to sacrifice the charity run experience to make it accessible to all. They surpassed their goal of $40,000 days before the event, which took place on March 21st, 2015. Takeaway Tip: If you want to host a virtual 5K, give participants the chance to engage with the larger community by connecting over social media and offering collateral like T-shirts. Founded in 1983, the San Diego Brain Injury Foundation is devoted to improving the quality of life for brain injury survivors and their families. They support the community surrounding brain injuries in San Diego through education, outreach, monthly meetings, and residential treatment. SDBIF’s eighth annual Walk for Recovery took place on March 21, 2015, raising over $58,000. A big part of the event’s success stemmed from fundraising teams organized by local businesses and organizations. 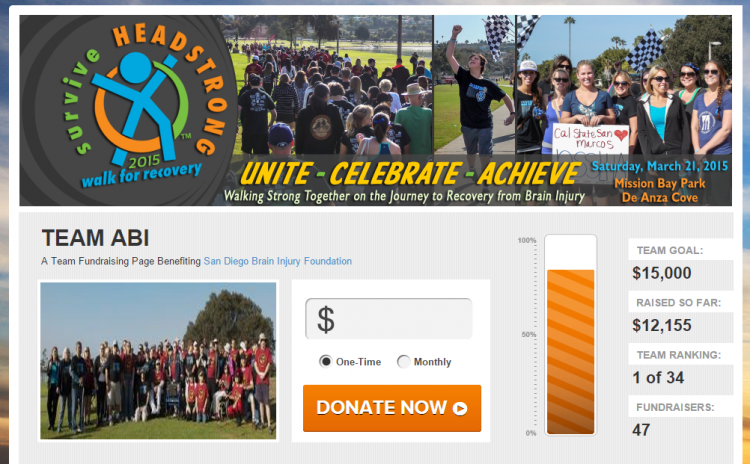 The Acquired Brain Injury program from the San Diego Community College District was the top fundraising team, raising over $13,000. The Walk for Recovery also benefitted from a team of local trial attorneys and other teams comprised of the families of brain injury survivors. SDBIF was able to mobilize people with personal ties to the cause along with local business and organizations. Takeaway Tip: Encourage families, local businesses, and other organizations to form fundraising teams for your run/walk event. Teammates can encourage each other and team competition can spur supporters to raise more. Having operated for over 50 years, PCI has been a powerful force in the fight against poverty, malnutrition, disease, human trafficking, and other problems. They operate a variety of programs in over a dozen countries in Asia, Africa, and the Americas. Their Walk for Water celebrates World Water Day by fundraising for clean water solutions, educating the public, and encouraging conservation. The seventh annual Walk for Water is a two-part event, with a 5K in London on March 21, 2015 and another walk in San Diego scheduled for April 19, 2015. While run/walk events are a common way for nonprofits to engage their audience and raise funds, the connection between the cause and the act of completing a 5K is not always apparent. PCI brought the experience to life by using their walk to simulate the hours of walking and labor many people must perform simply to get clean drinking water. Participants could even carry buckets of water along the course if they chose. PCI brings a deeper purpose to their charity run/walk by reminding their supporters of the struggles faced by those without clean water. Takeaway Tip: Link the physical component of your event to some aspect of your cause. By explaining the meaning behind the activity, you create a more emotional and impactful experience for participants. Charity run/walks are a proven fundraising model, but nonprofits continue to innovate and perfect their events. While incorporating new fundraising technology, they must also support and educate fundraisers to reach bigger goals than ever. When planning your next run/walk event, think about how you can learn from these all-star organizations and build on their success.